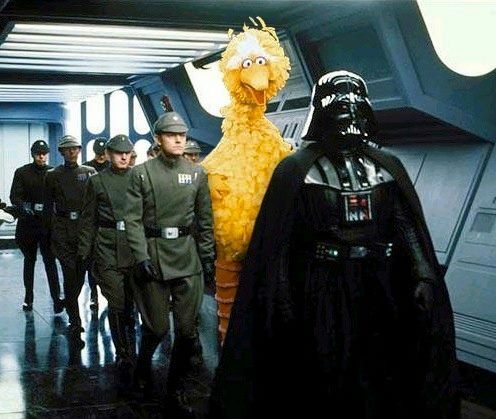 Click the pic to see how Big Bird accuses Darth Vader of being a Goth who needs to go to a Rave and drop some pills… I can totally imagine Darth Vader as a DJ. In other Darth Vader news, the voice himself, James Earl Jones received an honorary Oscar. Well done and well deserved. This is not it. This is a different Oscar. But it ties back to the original pic you see. Spooky. If you want to know what the Internet is, this picture from the memebase network (same as cheezburger) should explain everything. As an update to yesterday’s post, I also found this which is based on the same painting. So with some jiggery pokery image manipulation I have created what I think is one of the best villians from “A long time ago…”. 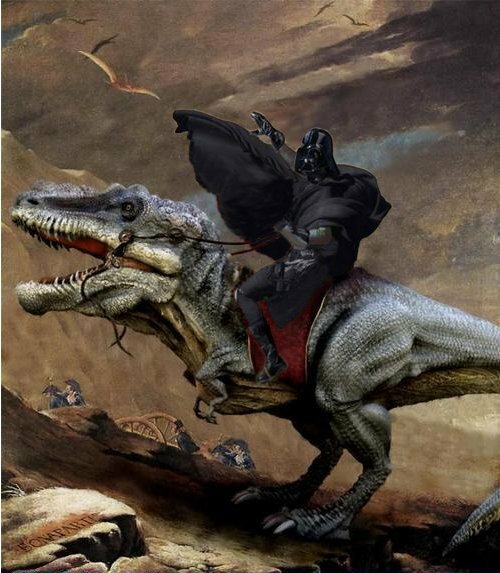 Darth Vader on a T-Rex! Your argument is invalid. And with a white background this is my new fussbook avatar.